Rishop or Rishyap, developed recently in 1998, is rapidly becoming a popular tourist point. Situated over the Neora valley at an altitude of 2,360 m, this hill station at the foot of Tiffin Dara comprises a Lepcha hamlet and a few resorts. 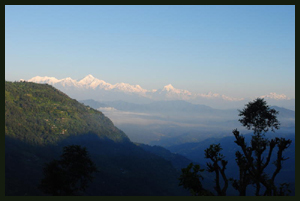 An excellent view of Kanchenjungha from ‘Tiffin Dara’ in Rishop attracts tourists to this place. The 300 degree visible mountain ranges you can find from Rishyap/Risop are (left to right) Mt.Kharg, Kokthang, Rathung, Kabroo (North, South, Dome and Fourth), Talung, Pandim, Khang-Chen-D-Zongha, Simvo, Narsingh, Siniolchu. Sunrise in Rishop will be in memory for years. The blue mountains of Sikkim by its side are also worth watching. Nathu La and Jalep La are also visible from Rishop. Sunset turns the snow-capped pinnacles into pink and gold. Only 11 km from Lava (walking distance – 4 km through pakdandi) & 27 kms from Kalimpong, Rishop is covered with Dhupi, Pine and Rhododendron trees. ‘Ri’ stands for Mountain Peak & some say it ‘lofty’ & ‘shop’ means Old aged trees. At Rishop the night sky is bright and clear. It may seem that the stars have come closer. Far below, one can view the lights twinkling in the nearby towns and villages. Southeast of Rishop is the Lava monastery. The entire village was not covered by motorable road only a year back, but now, vehicles can ply to the topmost part of Rishyap. To see the whole village, you have to walk down the mountains with majestic Kanchenjungha standing in front. An eco-tourism committee was set up here so that the village could be properly developed. Rishop is growing steadily in terms of no. of tourists and nature lovers. Midflat.com is India’s only property website where you can buy, rent or pg 100% brokerage free properties.